Wednesday: Dhaliwal now reports that the Boston Bruins are one of the teams with interest in Hutton, and that the club had a scout watching the Canucks in Florida last night. Tuesday: For Vancouver Canucks fans excited by the team’s early season success, the trade deadline will come as a bitter reminder at how far the organization still has to climb. After injuries broke a streak of success in the first few months of the season, Vancouver now finds themselves 28th in the league only ahead of Ottawa, Buffalo and Arizona. They’re obvious sellers as they continue their rebuild and hope to win one of the lottery spots. Now though they’ll need to decide where the cutoff is for assets that can help them down the road. Can a 24-year old defenseman signed for a reasonable amount next season help them more than another prospect or package of draft picks? 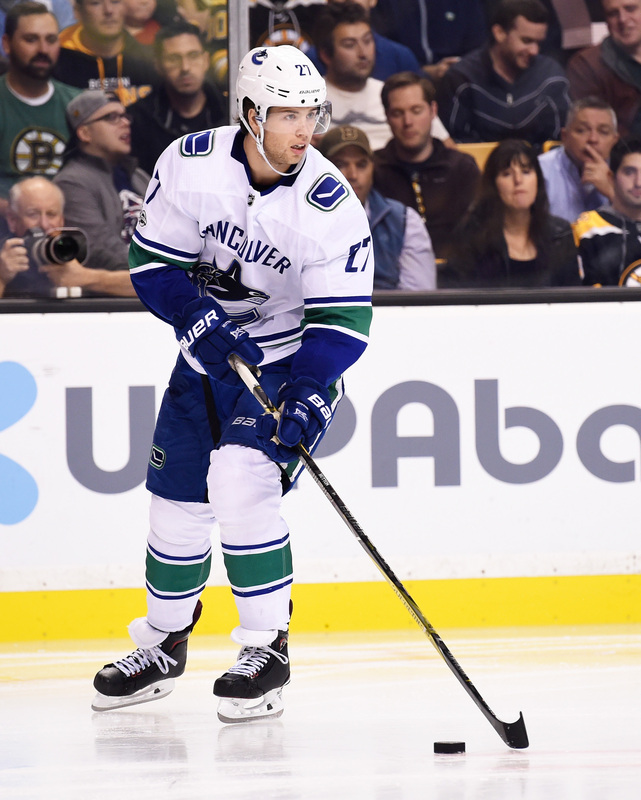 That’s the question surrounding Ben Hutton, who according to Rick Dhaliwal of News 1130, is generating a fair amount of interest around the league. Dhaliwal reports that the Canucks are certainly not shopping their young defenseman, but are willing to listen. Hutton, a fifth-round pick of the Canucks in 2012, has developed into a relatively effective two-way option for the club. Though his career-high of 25 points set as a rookie looks like it might be near the top end of his offensive potential, logging 19-20 solid-if-unspectacular minutes is no small feat. The decision though is whether Hutton, who is scheduled to become an unrestricted free agent after the 2019-20 season if he isn’t signed long-term, is a piece to build around on the back end or an asset to flip at some point. Turning 25 in April, there is certainly time for him to contribute to the squad as they try to turn from rebuilding to contending, but if that value can be used more effectively right now he could easily be on the move. Vancouver has more obvious trade deadline bait in players like Thomas Vanek and Michael Del Zotto, but as teams around the league move away from rentals or short-term options, players like Hutton become even more valuable in trade. If someone out there believes he can improve their blue line right away and for the next few years, the Canucks could decide to pull the trigger. There is certainly enough interest. If available I could see him as a target for the Pens. I thought so, too…then I looked up his cap hit. $2.8 m this year and next. Pass. His ceiling seems to be a top 4 dman, but not one to expect significant PP time from. Those type of dmen are a dime a dozen so they should move him while they can.